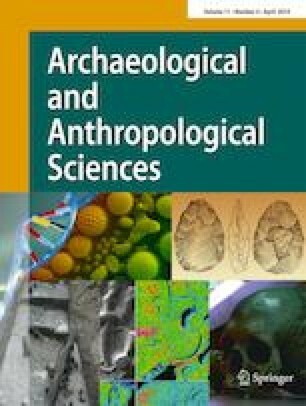 To explore the unique status of jade articles unearthed at the Kuahuqiao Neolithic site (~ 8200 to 7000 years ago), this paper studies the material and production processes of two pieces of jade unearthed there. In this study, micro-spot observation using a video microscope and nondestructive methods such as energy-dispersive handheld-type X-ray fluorescence (XRF) spectrometry, infrared spectrometry, and Raman spectroscopy were performed. The result of the experiment showed that the two jade huangs had plain surfaces without grain. Moreover, the jade huangs were composed mainly of sericite. The huangs were found to have been produced using wire cutting and solid drilling (both single-faced and double-faced), and the entire surface of each huang was polished. We also examined early jade huangs unearthed elsewhere in China and found that the jade culture in southern China may have developed independently. These two jade huangs are also important evidence for the formation and development of an early jade culture in the lower reaches of the Yangtze River. This work was financially supported by the Conservation Science and Technology Project of Zhejiang Provincial Administration of Cultural Heritage (2016).